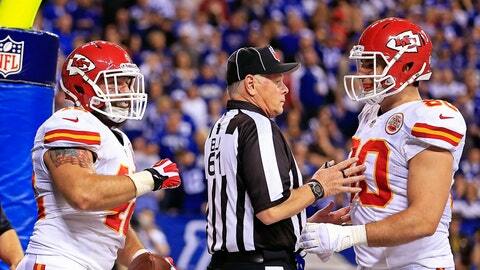 Pereira: So, how did the refs perform in the Chiefs-Colts game? Credit to the refs for not impacting the outcome of this game. You know the expression, "I’d rather be lucky than good?" I’d rather have Andrew Luck and be good. With Luck as your quarterback, you have both! Luck led the Indianapolis Colts from 28 points down in the second half to defeat Kansas City 45-44 in an incredible wild-card game that included an NFL playoff record total 1,049 yards by both teams. The game was amazing, and these type of high-scoring games are difficult to officiate. It’s one of those games that even the officials will remember long after their careers — being part of one of those very special postseason games. So how did the officials do? I graded the crew led by referee Walt Anderson with a B. The best part of the grade is that the officials did not have an impact on the outcome of the game. It was my kind of game because there weren’t many penalties, only six total. The time of game was 3:27, which is a little over the 3:07 average. The two on Colts: A defensive holding penalty should have been called on a play in the end zone and also a 12 men on the field penalty that forced Kansas City to call a timeout before the ball was snapped. The two on Chiefs: Two pass interference calls, one on defense and one on offense. The OPI was a missed pick. To put that in proper context, there are an average of five "misses" per game. Like I said, the crew earned a B overall. They kept control of the game, which was good, because there was a lot of emotion. There were also a lot of injuries, which contributed to the length of the game. But there were four misses, which keeps me from grading them higher. Any time you have a low-penalty game and only one replay review — where the replay on the field stood, which I do believe they got right — they did a pretty good job. Any time you have a playoff game where nothing is going to be written about the officials is a job well done.